This is the slide deck I presented at the Asia Pacific Centre for Social Enterprise (APCSE), Griffith University, Open Lecture Series this week. This TED talk is a useful summary of Paul Gilding’s book, The Great DIsruption. Listening to the first half of his presentation, one could be forgiven for thinking that Gilding has thrown in the towel, based on his projected level of doom and gloom. This is not entirely the case. Yes, things do look grim, but Gilding is not nearly as pessimistic as James Lovelock or Clive Hamilton. The book goes into great detail as why he (and his collaborator Jorgen Randers) believe there is a future for humanity with their One Degree War Plan. Tech solutions to climate change? At one time, I would have dismissed this kind of thing as science fiction, but since becoming a devotee of James Lovelock I am less dismissive of initiatives like these. If Lovelock is right, we have now reached a point where the mainstream sources of renewable energy (wind, solar, geothermal, etc) will not come on stream quickly enough to arrest global warming. Therefore, tech fixes are no longer just an option. 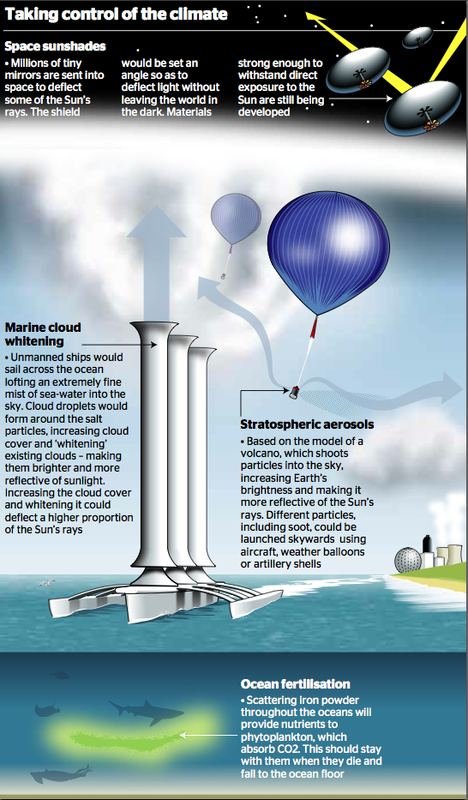 The latest idea is for a wind-powered fleet of 1900 ships to traverse the oceans, sucking up sea water and spraying it from the top of tall funnels to create vast white clouds. These clouds would then reflect sufficient sunlight to cancel out the greenhouse effect caused by carbon dioxide emissions. It has been estimated that the fleet would cost $9 billion to test and launch within 25 years, which is a fraction of the sum that the world’s leading nations are considering spending to cut CO2 emissions. What worries me, I guess, is that if such an initiative were to come to fruition, this might cause everyone to relax and carry on polluting with impunity. The fact the cloud ship idea is supported by Bjorn Lomborg serves to add to my concern. There is a characteristically controversial piece in The Guardian today by former NUM President, Arthur Scargill. While it is almost sacrilegious for me to say it — given my support for the miners during the famous 1984-85 strike — I’m unconvinced by his arguments. If clean coal technology were readily available this would be a no-brainer but, unless I am mistaken, there is a lot of work to do yet before this becomes a serious possibility. Unfortunately, as James Lovelock points out, we don’t have the luxury of time. This article was first published in XL Magazine, volume 4, issue 2, February 2008. If there is one issue that splits the green movement right down the middle it is nuclear power. At the risk of over-generalising, the two camps might be labelled the ‘idealists’ and the ‘realists’. Among the latter is a sub-group that might be described as ‘recently converted grudging realists’; a faction to which I was dragged kicking and screaming over the Christmas holiday when I read The Revenge of Gaia by James Lovelock. Lovelock is a boffin, brilliant-genius type, who New Scientist describes as ‘one of the great thinkers of our time’. Now in is eighties, his writing is as sharp and lucid as ever, and few books have so fundamentally challenged my beliefs as this one. Pre-Christmas, I was very much in what I now recognise to be the idealist camp. While certainly not a tree-hugging, doctrinaire environmentalist, I was a little scornful of the increasing number of ‘born-again greens’ who think nuclear power is the escape route from global warming. My reasoning, simply, has been that aside from the dangers associated with nuclear power generation – especially in the wrong hands – it simply doesn’t make economic sense. As renowned physicist and environmentalist Amory Lovins recently commented, nuclear power has ‘died of an incurable attack of market forces’. The only reason it still exists today is that governments subsidise it to such a large extent. Then there is the question of the amount of greenhouse gas that is produced in the mining and milling of uranium, the construction and decommissioning of nuclear power stations, and the transportation and management of waste. When in the idealist camp I have also publicly dumped on the Australian Labor Party (ALP) when, at its last party conference, a resolution was passed to allow new uranium mines. As Australian scientist Tim Flannery argues in his best-seller, The Weather Makers, given the widely acknowledged problems with nuclear power, it makes an inordinate amount of sense to explore this option only as a last resort. It is far better, says Flannery, to go as far as you can to reduce emissions by increasing the efficiency of energy use and exploring clean and safe renewable energy options. If future demand for energy can be met through these means, the taxpayer can save a whole lot of money, the environment will experience less damage, and the community will be a safer place to live in. So what’s behind my change of heart on the question of nuclear energy? The short answer is that Lovelock is a very clever man, and he puts forward some very compelling arguments. The most persuasive of all is the issue of waste. I now recognise that I have been a little one-eyed in this regard, by not considering the dangers of nuclear waste relative to the dangers of carbon dioxide waste. Nuclear waste is buried in pits and only dangerous to those foolish enough to expose themselves to it. Carbon dioxide waste, on the other hand, is invisible to the naked eye, freely-released, and so deadly that if emissions go unchecked it threatens the whole planet. Furthermore, as Lovelock points out, burning fossil fuels produces 27,000 tons of carbon dioxide each year which, if solidified, would create a mountain nearly a mile high, with a twelve mile circumference. To produce the same amount of energy from nuclear fission reactions would produce two million times less waste, occupying only a sixteen metre cube. Statistics such as these would appear to cast doubt on the long term viability of burying carbon dioxide waste in the ground (carbon sequestration). Nuclear waste, on the other hand, rather than threaten the environment might even be harnessed to protect it. Lovelock, referring to the Chernobyl disaster, points out that one of the most striking things about the area around the accident site is richness of the wildlife. Plants and animals do not perceive radiation as dangerous, and any reduction in their lifespan is far less likely than would be the case in the presence of people and their pets. Lovelock then goes on to suggest that tropical rainforests might be ideal sites for nuclear waste storage because it would protect them from farmers and developers, and allow them to continue to function as carbon dioxide sinks. On the economics of nuclear power, Lovelock is a little vague, but what is now becoming abundantly clear following the pronouncements of the scientists on the Intergovernmental Panel on Climate Change (IPCC) is that there is little choice but to use nuclear power because renewable sources of energy (e.g. wind, solar) will not be sufficient to meet our needs quickly enough, to reduce reliance on fossil fuels. At the very least, therefore, it is not a good idea to decommission existing nuclear power stations, or defer plans to build nuclear power stations. They may be expensive, but not nearly as expensive as the dramatic climate change that will be forthcoming unless something is done to reduce emissions. In summary, nuclear power is not the answer, but it is certainly part of the solution. While out running tonight, I listened to an LNL podcast of an interview with James Lovelock, of Gaia hypothesis fame. An excerpt is included here (11 mins) which provides an insight into Lovelock’s rather pessimistic view of the future for the human race. Applying his Gaia theorem, no matter what we do now he believes that by 2040, temperatures will have risen by 5 degrees centigrade and much of the planet will look like central Australia. The good news is that the self-regulating properties of the earth mean that temperatures will probably stabilise at this point. The bad news is that climatic conditions will be such that we will have trouble feeding ourselves. Lovelock estimates that by 2100, world population will be about 20% of its current level, and the few of us that survive will be huddled around the poles.